So each year when garage sale season starts my dad starts to come home with all these little knick-knacks and bits of things. "Can you use this?" Or "I thought you could use this-" are phrases I began to hear a lot of. The thing is that although I couldn't use them all he finds some really cool stuff. After he'd come home with a stash of skeleton keys, a ton of buttons, some really fabulous old wooden things, old bottles, etc. etc. I told him to open a vintage shop on Etsy. He thought about it a bit and recently we set up a shop for him, The Old Shop Teacher. But what really makes it a great shop is that my mom is adding some of her art made from vintage items to it. Years ago she made an amazing lamp for the spare bedroom we sleep in when we visit. 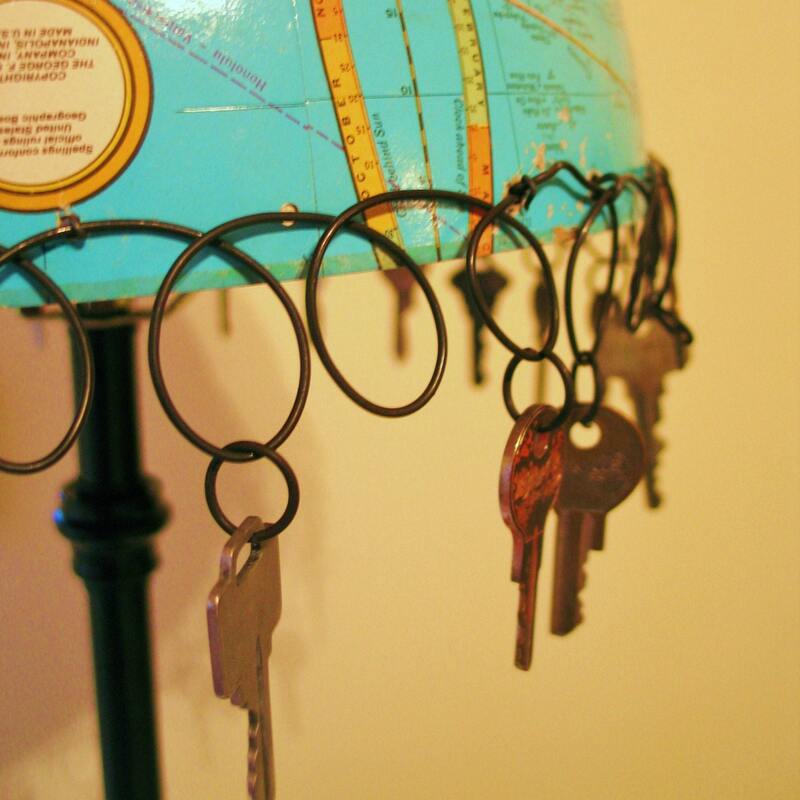 It's made of half of an old globe. I love it! She recently made a couple of more and has offered them for sale in the shop. And there's nothing else like it on Etsy- it's truly an original. She's also been crafting these fabulous clipboards from a stash of vintage one's used in the high school my dad teaches at. They have a beautiful patina from years of use and I love that she doesn't over do it with the decorations/ribbons so that you can still see the old metal clip. I particularly love the one at left. She used paper from October Afternoon that has a map of MN on it. Then added a little red car traveling up 35W which is the road to Minnesota's North Shore- one of our favorite vacation destinations when we were kids. 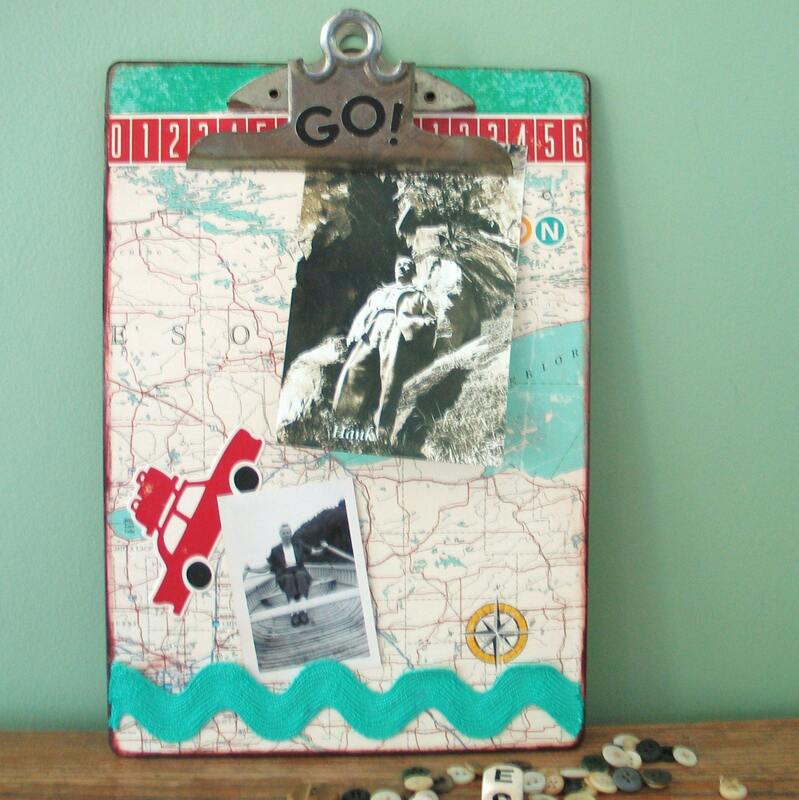 Although these work great as clipboards, I love seeing them displayed as photo frames. My parents are both teachers and soon to be done with school for the summer so expect some more amazing finds and fabulous vintage creations soon!!! Wow, that is so cool! I love that your parents are into the etsy thing and making eclectic things. I should really get my dad to put some of his pottery on there...though it doesn't really ship well i suppose. Anyway, cool lamp! Hey Jen ... just found your blog. Love this posting ... so amazing that you have started this etsy shop for your parents - what a great idea ... I need to get my father to invest in a computer and get him to do this too ... he'd love it. I really like the clipboards (I do them too with my daughters) ... the one with the robin is very inspiring - I can't wait to show it to my daughter (Robyn) when she comes home from school today. I will be following your blog now ... love your "renaissance women" comment and I'm sure that you will be inspiring me more. Looking forward to getting to know you more. Wow hat a talented mum you have. I bet both her creativity and your Dad’s vision contributed to your creative spirit. 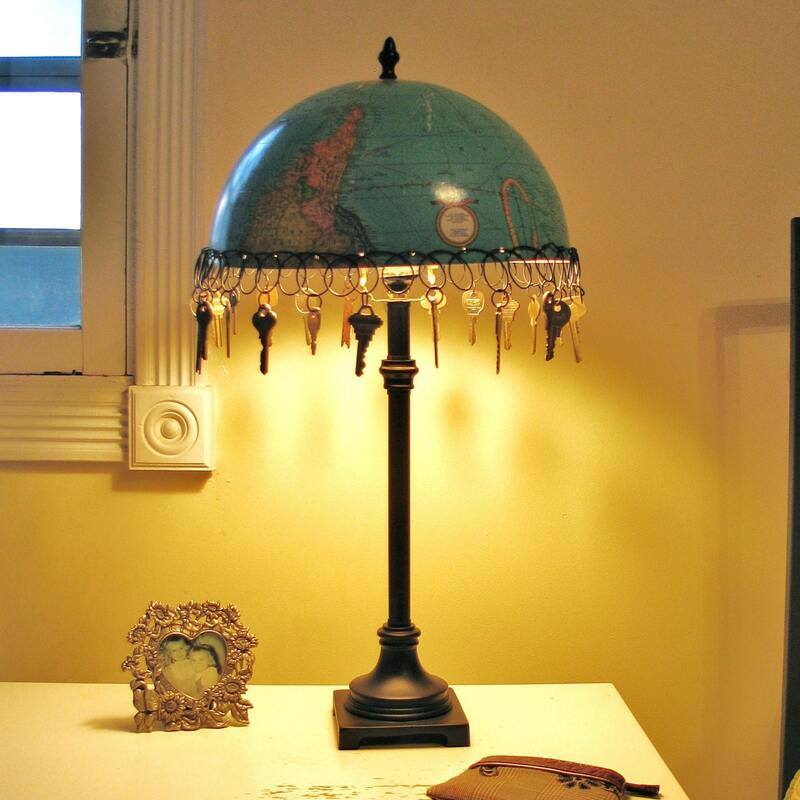 i love your mom's globe lamp. so unique and creative. such a great idea. Thanks for the wonderful and inspiring comment you left at my blog. I really appreciate it!! It's nice to know someone else has been where I am and come through the other side. You were right. Etsy is addictive and so is your blog. I just had to order the glob you've featured here made by your mom. It's absolutely perfect for my husband for Father's day and I can already see it sitting on his bedside table. We needed to get another lamp so it's both practical and very cool!! It's funny you should say that the scribble heart is meant to be a talisman for a creative space. As soon as I saw it I pictured it on the wall beside my computer, which is where I do most of my creative work (photoediting, blogging, digital art). I just know it's going to bring tons of positive energy to my currently bland workspace. Thanks so much! Can't wait to see both items in person! Now I'm off to add you to my blogroll. I want to say thank you to everyone who made such sweet remarks about my lamp. Jennifer has been bugging me to make another ever since I made the first. She even bought the globe and brought it over. I need to create things to be happy, but I really didn't think people would buy something I made! So this last weekend two things I posted on etsy sold and it was cool but they weren't things I made and I was telling myself to stick with that sort of thing so you have no idea the pleasure it gives me that other people like my "whimsy"! Thank you so much! It does my heart well.